ITM Group of Institutions is accepted as affiliate member of the OECD International Network on financial education (INFE). ITM is the only Institute in India to get this status from OECD. Accredited education provider for Chartered Institute for Securities and Investments (CISI, UK) for conducting continuing professional education program in India. NTTF - Nettur Technical Training Foundation for various Engineering Trades. Linkages with high technology companies like Thyrocare, StemRx for B.Sc.- Bio Science and B.Sc.- Health IT related Courses. Source-and-Train model of Bank Officers with ICICI Bank, Kotak Mahindra Bank and ING Vysya Bank. ITM Skills Academy is training over 1000 bank officers per month with academies in Vadodara (ITM Vocational University - Gujarat Campus), Raipur, Warangal, Greater NOIDA and Bangalore. Training all hospital staff in Management for Hinduja Hospital, Mumbai and many others in pipe line. ITM Group has developed various sector specific programs with global collaboration with reputed Universities / Institution abroad for the various Sectors like Finance and Financial Markets, Hospitality & Health Services, Other Sector Specific Programs, Engineering and other technical courses. Queen Margaret University, Edinburgh, Scotland for Hospitality, Culinary, and Service Sector Management. Deakin University, Australia for International MBA. Maastricht School of Management, Netherlands for International Finance. Shoreline Community College - USA Associate Degrees in CNC Machines and High Tech Auto Assembly. ➢	Ras Al Khaima Medical and Health University, RAK, for Nursing program transfers from ITM Nursing programs. ITM Vocational University (ITMVU) and Herzing University, USA signed articulation agreement to share a commitment to student success in higher education. ITM University has integrated General Education Stream and Vocational Education Stream in higher education space. Herzing University is founded on the basis of a high standard of principals, belief, ethics, and trust; trust in each other and student trust. The articulation agreement between ITM University and Herzing University enables management undergraduates and post graduates get credit transfer from ITM University to Herzing University and get USA degree with one year study and stay and get an opportunity get one year optional practical training post study. All this with affordable fees in USA. ITM Group of Institutions understands the quest for developing career visions with the help of theory, practice and modern infrastructure. Thus ITM Group of Engineering Colleges have collaborated with Sitrain, the Siemens Training Academy. Siemens AG, a German multinational corporation headquartered in Munich is a world Leading company in the fields of industry, energy and healthcare. 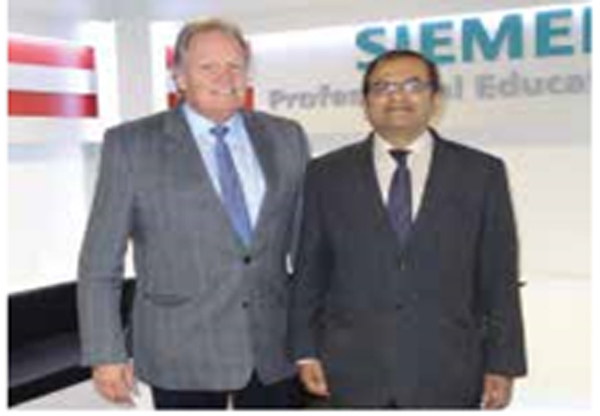 The Siemens Group in India is a leading Hi-tech company in India which seizes a foreseen bright future for professional leaders World class technologies developed by Siemens in the core business segments add value to its customers. Siemens Training Academy- SITRAIN SITRAIN, a global training and competence center managed by Siemens lays out a platform to share knowledge and innovation to help you achieve the best results with their systemized solutions. SITRAIN basic labs are setup at ITM Vocational University at Vadodara, ITM - College of Engineering Nagpur and Coastal Institute of Technology and Management, Vizag and ITM University at Raipur. Thus students getting admissions in ITM will receive training on World Class Siemens products and Siemens Certification. 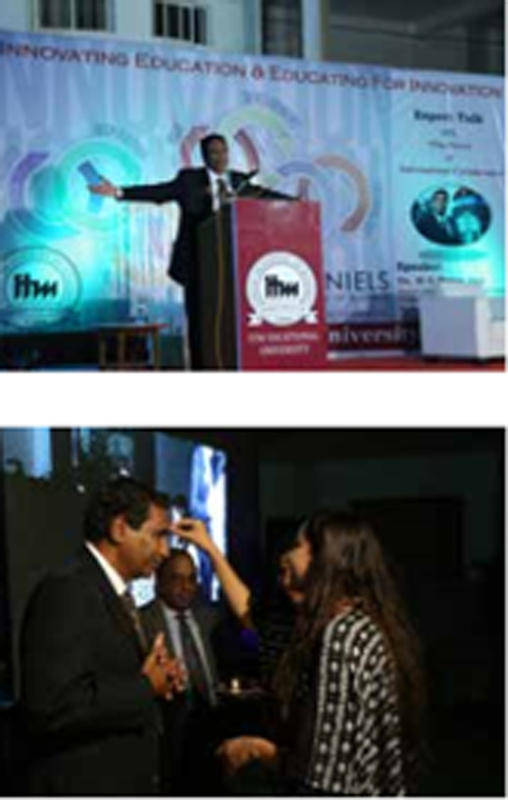 ITM University views this as a vast opportunity to develop world class Engineering Graduates to serve India. The two members high power committee of RMIT University comprises of Mr. Peter W Ryan, Executive Dean of school of Vocational Engineering, Health and Sciences, and Dr. Arvind Sharma, deputy head of School of Vocational Engineering, Health and Sciences was in ITM VOCATIONAL UNIVERSITY on Feb 22, 2016 to strengthen the existing collaboration. During the visit, a credit transfer agreement between RMIT and ITM for the transfer of ITM students who have completed the three year of the six year integrated B. Tech program at ITM Vocational University, into the second year of RMIT associate degree in engineering technology program is being firmed up. Industrial Visit, training and internship is one of the key parts of the curriculum at ITM Vocational University. Recently university signed MOU with KARVY Stock Broking Ltd, Hyderabad to provide on the job training and placement for MBA and BBA students of Faculty of Management, Economics & Commerce. Under this agreement first batch of seven MBA batch 2015-17 students reached KARVY, Hyderabad on 15 January 2017. The students started their training at KARVY, Hyderabad on 16th January 2017. 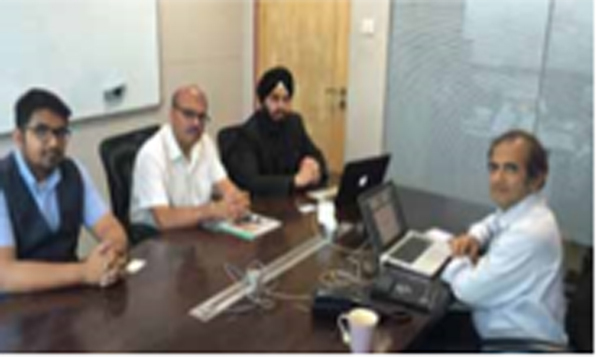 They introduced to the HR Policy by HR officials and had one to one interaction with Mr. Rajiv R Singh, CEO Karvy Stock Broking. Initially, the training will be for three months, during this period they will be entitled for stipend and incentive as per the company policy at par with other employees. The interns will get extensive training on various aspects of the financial markets. Also, get the chance to meet experts in research, Technical analysis, Fundamental analysis, economic analysis and various other experts form the industry. 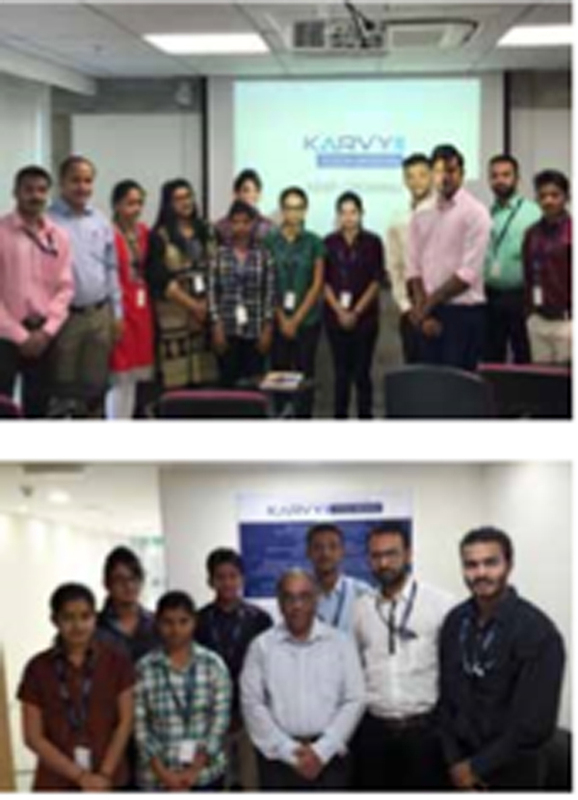 On completion of the three months training interns may be absorbed by KARVY as Financial Adviser/ Equity Adviser based on their performance. ITM Vocational University in collaboration with University of Wolverhampton, UK, proposes following: • ITM Engineering students (B. Tech) can be transferred to UoW UK for the last year 3+1 Program. • ITM Master students (M. Tech) can spend one Semester in UoW. Under 1+1 program. ITM students can do 14 days summer project in UoW. • Under this program students can get the directly transfer to the UoW in UK, if the students fulfill all the admission criteria. Students selected for this 3+1 program will have an option to pursue their respective engineering branch as well as about of six months of Internship which will be facilitated by the UoW. Upon completing the degree requirements successfully, those students will be awarded an Graduate in Engineering degree in UoW. Collaborative Program between the University of Denver, USA and ITM Vocational University. ITM Vocational University in collaboration with University of Denver, USA, proposed collaborative 1+1 graduate degree program in Management. This program is designed to allow maximum administrative freedom to both the institutions and at the same time optimize the strengths of each institution for maximum mutual benefit. Students meeting the DU admission guidelines for MS degree programs in the Daniels College of Business (DCB) will be given direct admission to one of the graduate degree programs (MS Degree) at the DCB. All these degree programs are designed such way that students can successfully complete the degree program in one calendar year or sooner. Upon completing the degree requirements successfully at the DCB, those students will be awarded an appropriate MS degree from the DU. Upon successful completion of the One+One graduate degree program, students may be eligible for Practical Training Visa in the USA subject to prevailing visa. ITM Vocational University Signs MOU with Federation of Gujarat Industries (FGI). FGI and ITMVU signed MOU on 16th December 2016 and agree to cooperate in the areas of Engineering & technologies and services, to maintain and further mutual cooperation and understanding for the purpose to collaborate and contribute to the overall development to truly innovate in the field of Engineering & technologies and services. ITMVU and FGI will collaborate in organizing technical activities such as Workshops, Seminars, Popular Talks and Conferences and also exchange information of technical events for the joint program execution and its promotion on mutually acceptable terms. These activities may be organized jointly, at local, national or international levels. Also, FGI will help ITMVU organize Industry Tour for the faculty and student. FGI and ITMVU may initiate support for R&D projects focusing on needs of the industry and society as a whole. Collaboration with Institute of Electronics & Telecommunication Engineer (IETE) In the year 2017. IETE Student’s forum at ITM Vocational University is an organization formed by the students which works for the students. The basic aim of IETE Student’s forum is to enrich students with different qualities to add dimensions to their personality so that every student emerges as multi-functional engineer who is globally recognized. 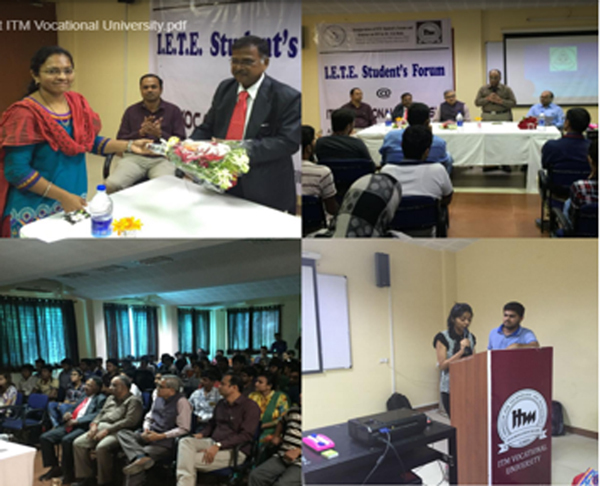 IETE Student’s Forum was inaugurated on 23rd September, 2017. The motto of IETE Student’s Forum is to mould one’s personality in such a way that one becomes equally competent in all streams of engineering and press the students towards the zenith of developing them in an all-round fashion and in years to come, it shall be consistent but with lateral improvements. Counselling the students in emerging new opportunities. It will provide a common platform for student members to exchange their idea and information on topics of their interest like curriculum, employment, higher educational opportunities, emerging trends, new development etc. Better Employment of students on completion of their courses. The memorandum of understanding is made and entered into on the 23 August 2018 between ITM Vocational University, Vadodara, Gujarat and Confederation of Indian Industry, Young Indians in the presence of Honorable Provost, ITM Vocational University, Dr. K.S. Murthy; Mr Goldy Tiwari, Chair, YUVA, Yi Vadodara; Mr. Hamza Adenwala, Executive Member CII Yi; faculty members and students to influence, inspire and motivate students, Yi will work with ITM Vocational University by forming a Yi Yuva. The CII-Yi Yuva platform is one of the most active focus areas within Young Indians by which Yi members engage students from across the country in various initiatives that the students conceptualize, plan and execute. The objective is to create a bridge, a platform for the students to work in cross functional teams with a broad objective of enhancing their leadership skills and giving back to the nation. In the process, the students work in leadership roles while operationalizing projects that are based on self-development, skill building, community service and nation building. Through the CII Yi Yuva, Yi intends to provide an opportunity to start thinking and work for India, Sowing the seeds of thinking about India and its growth at schools, colleges and University, an invaluable motivation for young minds to see how other young achievers are making a difference, bridging potential with achievement, a unique networking opportunity with peers across the country, developing leaders for tomorrow, an experience on leadership and team building and an opportunity to volunteer/ participate in Yi events at the chapter and national level.